The acai berry fruit looks pretty much as a small sized grape, but unlike grapes, acai berries come from the acai palm tree – native to the regions of South and Central America. It is round and about one inch in diameter (2 – 3 cm). Appears deep-purple and reddish in color when completely mature. So if you see it dark-green – just don’t buy it – cause it’s still immature. very rich in nutrients in relatively smaller quantities. Acai berries are a superfood. A superfood with some of the most fantastic properties – weight loss and anti-aging. But are those claims really true? Generally Acai Berry fruit contains antioxidants, vitamins, minerals, fiber and fats (that are good for the heart). Honestly speaking Acai Berries are not much different from similar products like blueberries, for example, but recently have been recognized as Superfood in the Western world, which inevitably lead to such huge craze about them. Anthocyanin is the antioxidant that gives this rich purple color to fruits. Anthocyanin is a very powerful antioxidant with the ability to protect the body from harmful free radicals – disposable products of our body metabolisms. High caloric values between 80 to 250 calories per 100 grams of fruits depending on method of preparation and serving. 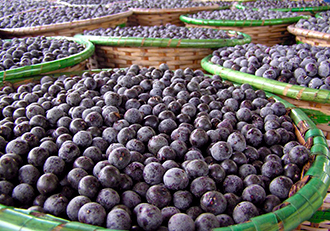 Acai berry fruit is also rich in oleic acid (omega-9) and linoleic acid (omega-6). They aid reduce bad cholesterol levels and raise good cholesterol levels in the body. Hence why those fats are good for the heart, cause they help reduce the risk of heart disease. Acai Berry fats are used in beauty products for their great properties to prevent skin dryness and maintaining balanced moisture in the skin. Acai Berries aid perfectly digestion and work great for detoxification and cleansing of the body from the bad cholesterol and free radicals (excretes them through stools and urine). Potassium helps controlling heart rate thus regulates blood pressure. Vitamins help the body to better metabolize proteins, carbohydrates, and fats. Does Acai Berry help weight loss? Yes, if you rely on the websites, which sell weight loss products that contain an Acai Berry extract. Usually these are capsules, drops, juices or some other form of Acai Berry extract. Yes, if you rely on the good old nutritious diet of fresh Acai Berries, that has been used for centuries by the native Amazonian. Yes, if you ask any dietitian – I am pretty sure they will agree that Acai berries, like any other fresh fruits, are a extremely important part of any healthy eating diet plan, which purpose is to help you lose weight and maintain it. 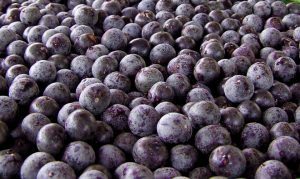 How to find the perfect Acai Berry product for weight loss? I will continue my research into Acai Berry health properties. I am sure there must be a high potency acai berry extract formula that is most beneficial for successful weight loss. However, if you prefer eating fresh Acai Berry fruits, then you should know how to combine and prepare them into smoothies, low-fat desserts, in-between meals (snacks)… I will look into a few diet recipes. How to fully enjoy these nutritious and exotic berries? Yes, it is important to know how to fully enjoy the taste and experience the benefits of these small purple reddish berries – fresh or frozen, of course. One thing is for sure – acai fruit pulp is much richer in antioxidants compared to the pulp of some other similar fruits such as blackberries, strawberries, or blueberries. So you either eat the whole fruits fresh or use them to improve the flavor of other healthy meals you like. You can also use frozen acai berry pulp or pure to make a fantastic weight loss smoothies and desserts.